All our staff have undertaken the Certificate in Water Conservation course and we are mentioned in the press release below from the Horticultural Traders Association. Since its launch a year ago, 100 professionals have now completed the ‘Water Conservation Course’ developed through a joint initiative by horticultural and landscape industry trade associations in partnership with a number of UK water companies. The aim is to reduce the demand for water in areas labelled by the Environment Agency as “serious water stressed”. It requires horticulture professionals to demonstrate high standards of sustainable, cost effective and environmentally sensitive use of water in gardens, parks, sports grounds and other amenity areas. The certificate enables holders, and the companies they work for, to take a leading role in demonstrating and promoting best water management practice to the public. And, since all new homes and all commercial properties have metered water supplies, those individuals and companies have a potential competitive advantage in helping clients control their water charges, whilst enjoying the benefits of their new garden or landscaping. 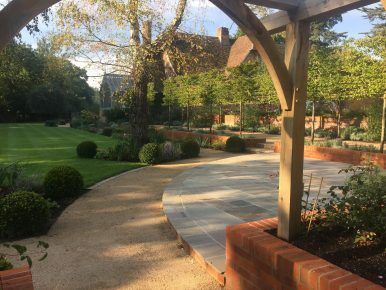 Paul Cowell, Managing director of PC Landscapes Ltd added: “When we learnt about this course we immediately made it company policy that all operatives would take part. Our company ethos is one of sustainability where we design, construct and maintain the landscapes we plan. The online test reflected this perfectly.